Alcoa is the best performing stock in our Industrials & Materials mid and large cap universe this year, driven by improving fundamentals in the aluminum market and Alcoa’s more pure play appeal given the split from Arconic last year. 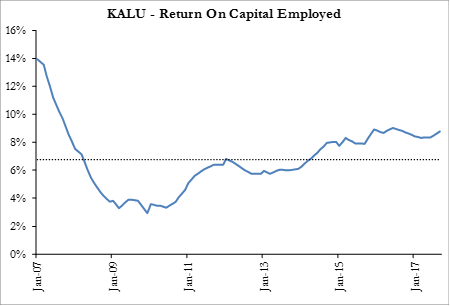 The stock is up 68% year to date, but in this piece, we make a case that it could go higher – both from a cyclical perspective and from a “normal value” perspective. 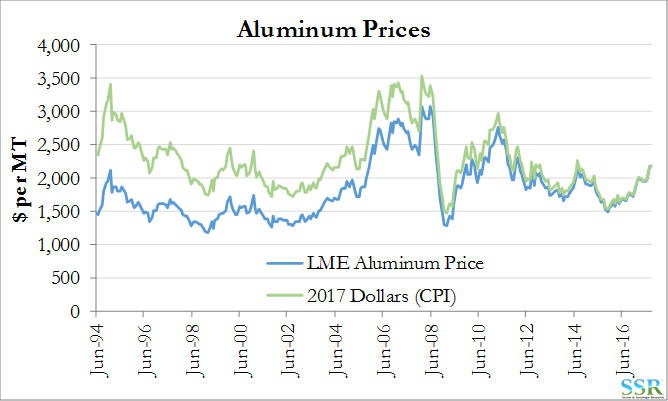 The fortunes will ultimately be dictated by the price of aluminum, but in real terms aluminum is not expensive, even with the recent move. The fundamental story for aluminum – a subject we have published on many times in the last 5 years – rests on the demand growth rate – which is higher than for any other commodity – in excess of 5% per annum. The easily recyclable nature of aluminum is a counter to this in some applications, but strong and growing demand from autos is a significant driver and aluminum should see a near-term boost from the hurricane damage in the US. AA has a declining trend to its return on capital, and when used to drive “normal value” the stock looks expensive, but still 50% shy of a cyclical peak. 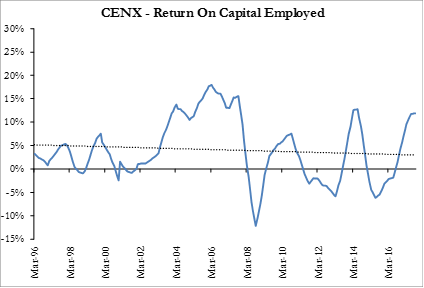 Trend return on capital is currently 4%, which is likely unrealistic. Average from 1980 is 5.8% – still low, but in line with current returns – if we use the average in our models, normal value for AA is just under $70 per share and a peak would be north of $100. 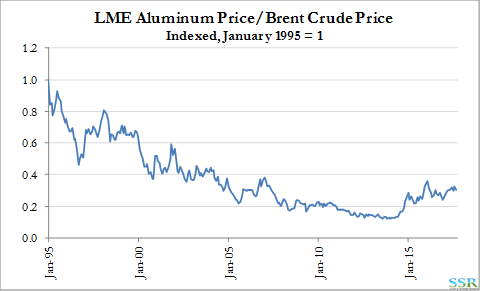 The risk is the cyclical nature of the aluminum market, illustrated in the volatility in Exhibit 1. Lows of the last 10 years have been driven by overbuilding in China, but we are seeing some of the limits to that production today as local and international demand has grown. New capacity additions do not look like they keep pace with expected demand growth from here – but restarts could swing the balance, especially in China. 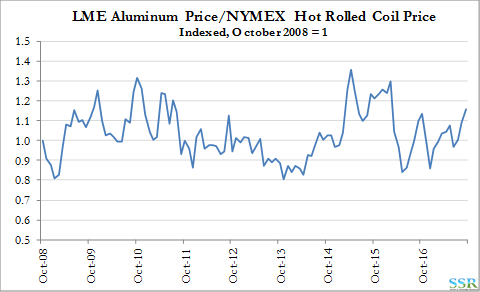 On the other side, we cannot see how rising metal prices are good for Arconic – see research. 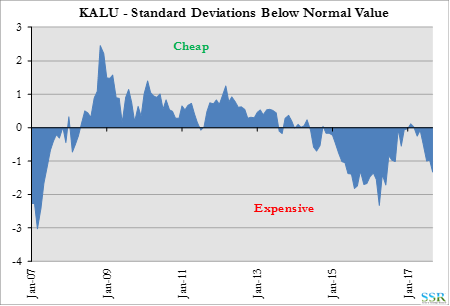 As shown in Exhibit 2, despite the recent rally in pricing, aluminum is not expensive in real terms when compared with its own history. The real average price for aluminum since June 1994 is ~$2250 per MT, and the metal has peaked at or above $3000 per MT on four occasions. Aluminum is well off its lows relative to competing materials (Exhibit 3) if we use oil as a proxy for engineering plastics, but it is also a long way from its highs versus both oil and steel (note that the steel analysis covers a much shorter time period). The situation versus engineering plastics may be less of a correction than the chart shows, off the lows, as the plastics industry is getting some pricing power and margins are expanding over costs. We don’t see anything demand destructive in aluminums current price in absolute terms or relative to other materials and pricing would have to be much higher and for longer to encourage meaningful substitution. Alcoa and other aluminum stocks have reacted to the move in the metal price and the associated positive revisions and while much of the upside is behind us, there is potential – more in AA than in others if we see the current rally in aluminum continue. 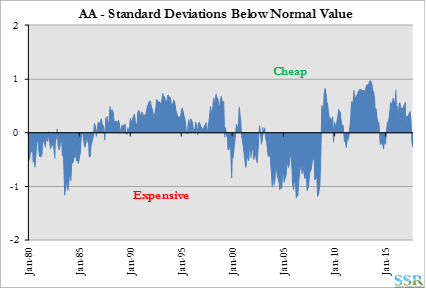 Exhibit 4 shows a summary of the valuation analysis that we work through in this section. The first chart shows the discount/premium to current normal value – and we have two scenarios for AA. 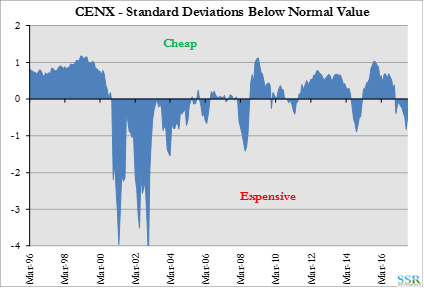 In the chart to the right we show upside to a cyclical peak in valuation – assuming that the stocks move to 1.5 standard deviations above normal. Based on revision consistency – Exhibits 5 – and the market’s current thirst for momentum, AA looks the most likely to command and justify a valuation premium. 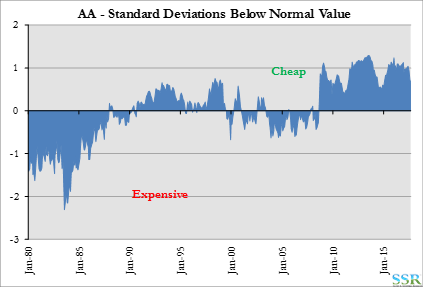 As suggested in the bullets we have been playing around with what likely best represents normal value for AA, given the portfolio changes and the extreme low in aluminum over the last few years. In Exhibit 6, the recent low is pulling down the return on capital trend line, which prior to that period would have been relatively flat. If we use the trend we get a current normal value for AA of $41 per share and the stock is obviously above that level, but well short of volatile peaks, which might suggest as much as 50% upside if metal prices keep moving. 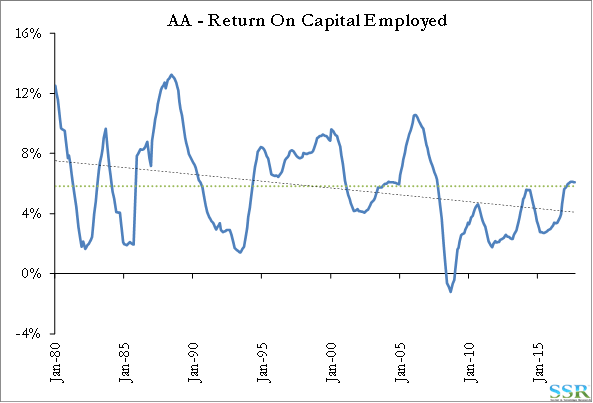 However, if we assume that the recent dislocation is penalizing value unduly we can make a more bullish case. The trend ROC gives a current “normal” return on capital of 4%, which is unsustainably low for a company that does not sit at the top of the cost curve. If, instead, we use the longer-term average ROC (including the recent history) we get an ROC number of 5.8% – still very low, but in line with what forward estimates suggest today. This generates a normal value that is above the current price ($70 vs $47) and upside in a cyclical swing of more than 100% assuming that the stock could trade 1.5 standard deviations above normal. If we are going to apply an average ROC to AA then we should do so as well for CENX – this gives a normal ROC of around 4% and current earnings and valuations are well above that as shown in Exhibit 8. This is a much more volatile name than AA (if such a thing is possible), and still has plenty of upside to hit a cyclical valuation peak – just with more risk. 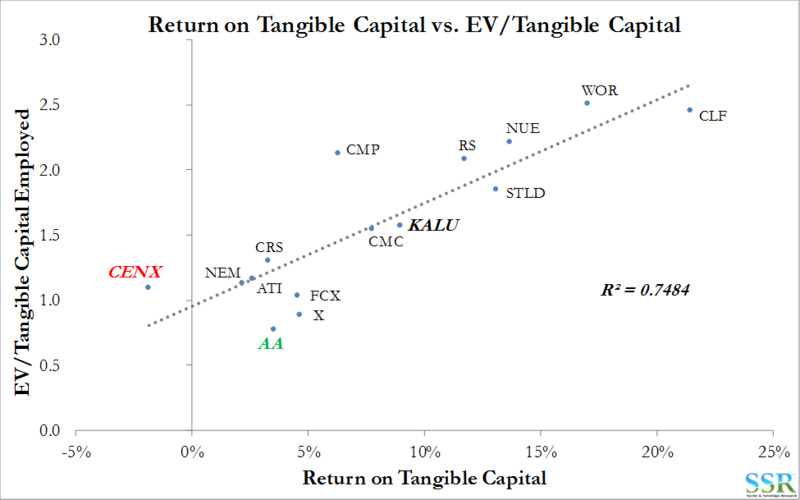 Using our return on tangible capital approach to valuation, AA also appears most interesting as it is below the metals trend line and by the largest margin. 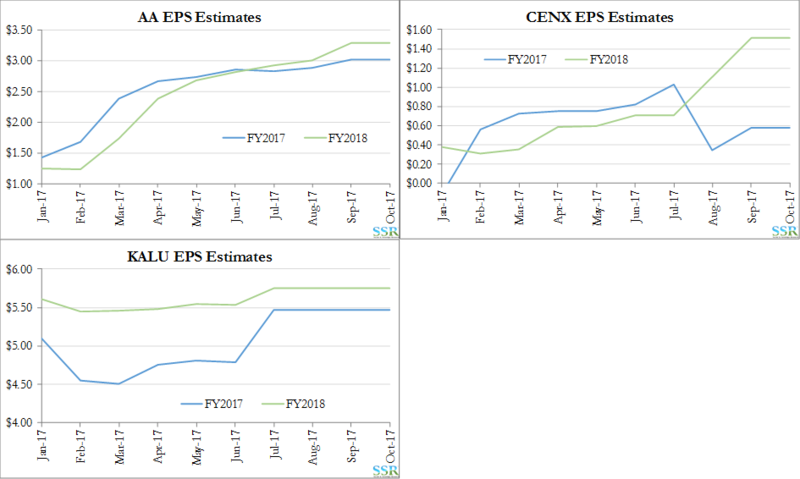 CENX looks the most overvalued on this basis – Exhibit 10.